I’ll be honest here….lunch is not my favorite meal of the day. I’m often running here and there during lunch time and end up throwing some leftovers together, making a salad, or eating the oh so healthy cheese, crackers, and apple lunch. Hey, at least I add the apple. BUT when I actually plan ahead, with very minimal effort, I can have an awesome lunch of Rosemary Chicken Salad. Why don’t I do this more often? It’s so good! 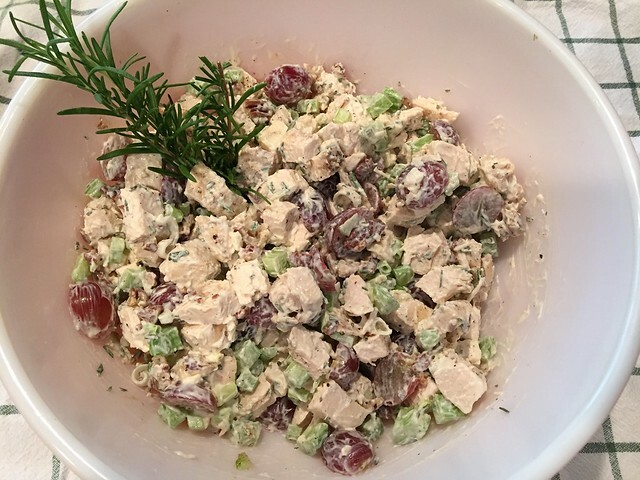 I’m a big fan of pretty much any kind of chicken salad you’d care to offer me but this one, flavored with fresh rosemary and pecans has quickly become my new favorite. To make life easier, I often bake the chicken in advance and make extra. That way I can use chicken for dinner one night and pop the rest in the fridge for chicken salad later in the week. 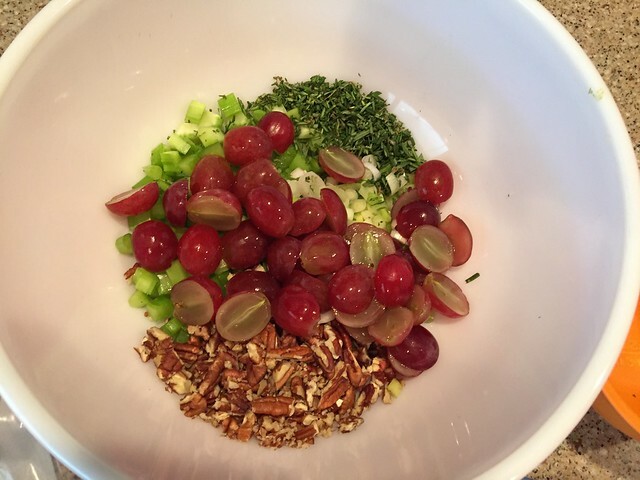 Chicken, Celery, Green Onions, Red Grapes, Fresh Rosemary, Pecans, Mayonnaise, Olive Oil (for cooking the chicken, not pictured), and Salt & Pepper. As I said earlier, whenever I’m cooking chicken, I usually make extra so I can have some leftovers and options. It’s great to slice up on a green salad, toss in a quick quinoa salad, make a quesadilla, or just eat as is. Preheat the oven to 350-375 degrees. Either temp works so if you have something else in the oven, throw the chicken in there with it and save yourself time & energy. 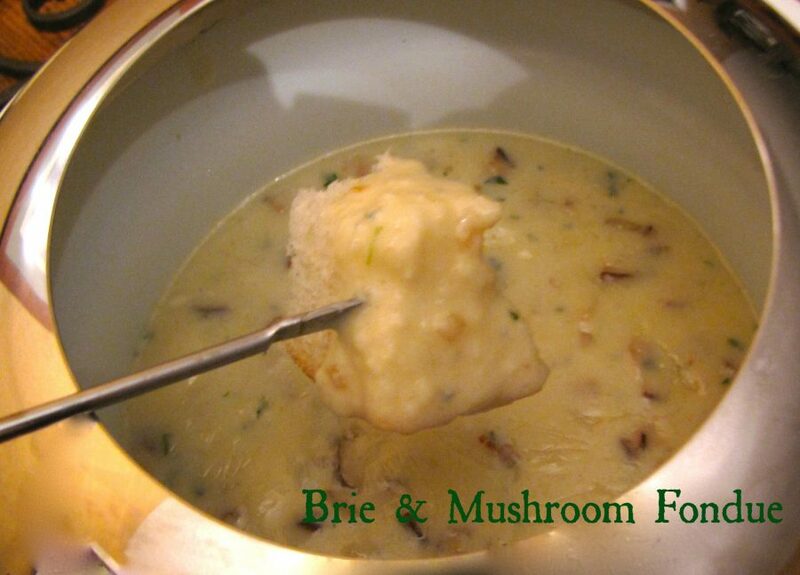 Feel free to use bone in, with skin on or boneless, skinless chicken breasts. I use whatever is on sale or in my freezer. 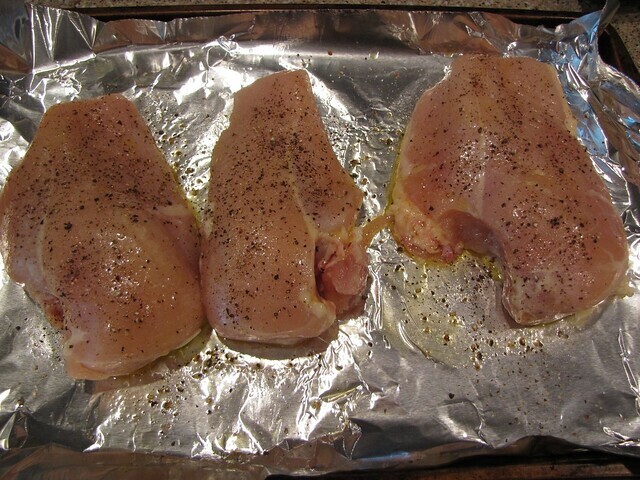 Place three chicken breast halves on a foil lined tray and drizzle with olive oil. Season generously with salt & pepper and bake at 350° (or 375°) for 35-45 minutes or until the chicken is golden brown, the juices run clear, and the temp reads 160° on an instant read thermometer. 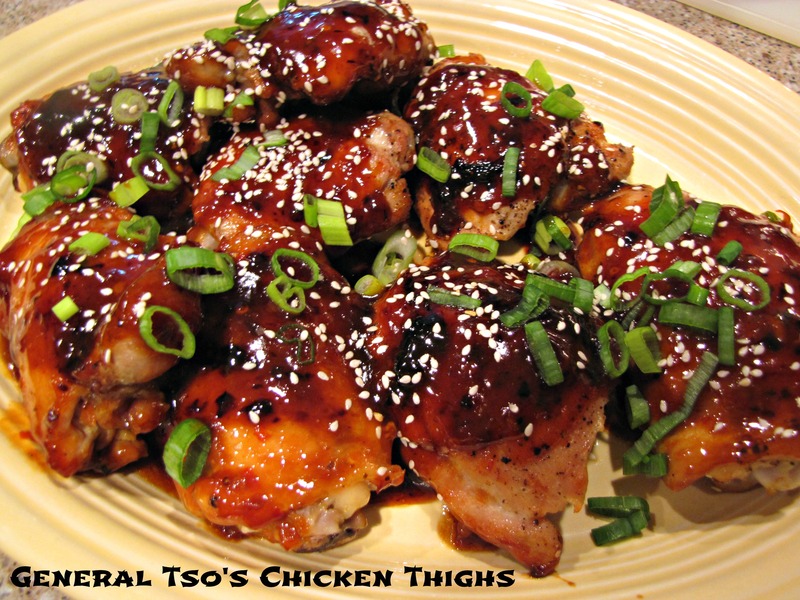 Cooking times will vary depending on the size of your chicken and whether it has bones or not. 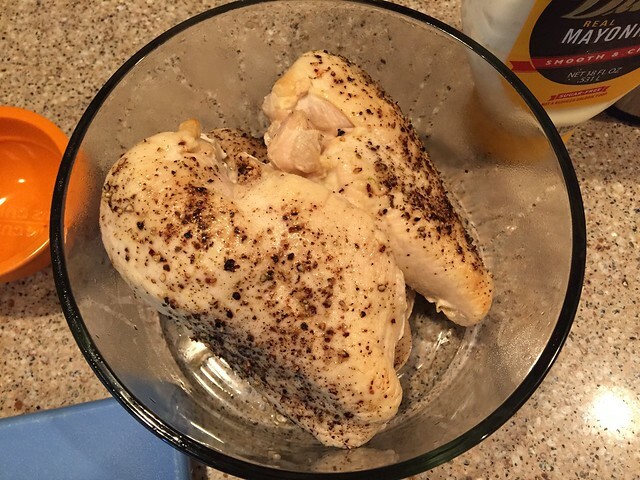 The boneless, skinless breasts usually cook in about 35 minutes. Let the chicken cool and then pop it in the refrigerator until you’re ready to make your salad. If you’re making the salad right away, it’s important to let the chicken chill for at least 20 minutes so that it doesn’t shred when you cut it. 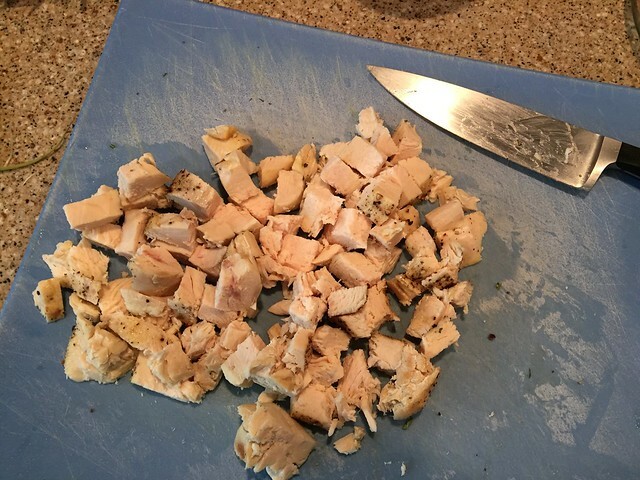 If your chicken had skin when you cooked it, remove and discard it then cut the chicken into bite sized cubes. 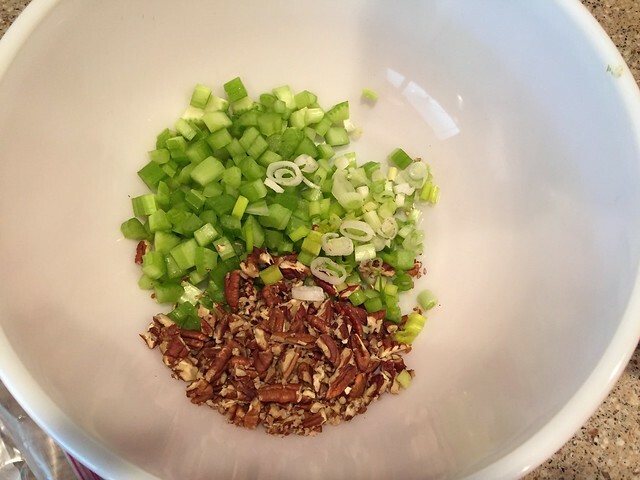 Finely chop 2 ribs of celery and 2 green onions and add them to a large bowl. Chop 1/2 cup of pecans and add them to the bowl. If pecans aren’t your thing, feel free to substitute another nut or leave the nuts out completely. We’re nut people so I’ve made this with pecans, walnuts, almonds, and even cashews. Fresh rosemary is a must. I DO NOT advise you to use dried rosemary unless you really like the taste and texture of twigs. Fresh rosemary is super easy to grow yourself and is readily available at most grocery stores. 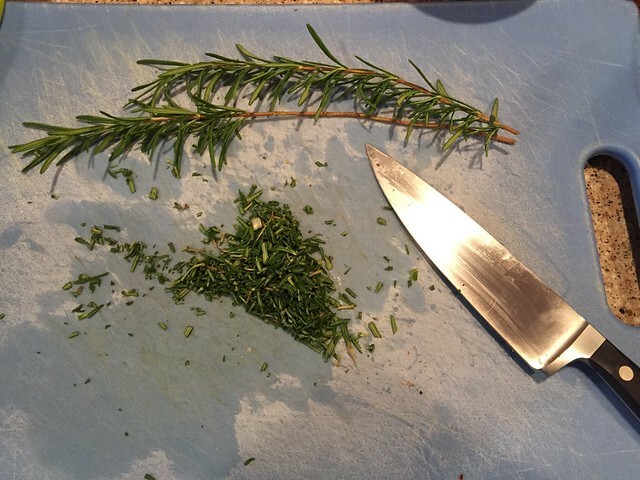 Strip the leaves off of 2-3 stems of fresh rosemary, give them a chop, and add them to the bowl. I like rosemary so I use at least 1 Tablespoon. Jim loves grapes in his chicken salad so I have 1 cup of red grapes that I have sliced in half. Sometimes if I don’t have grapes, I’ll chop up a nice firm apple instead. Add the chicken to the bowl and add ½ cup of good mayonnaise. Fold the mayo into the salad adding more as needed for a creamy consistency. Season with salt & pepper and stir to combine. 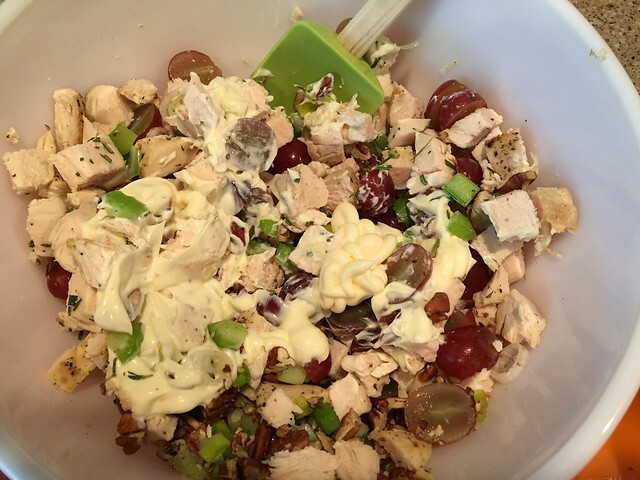 I like my chicken salad pretty light on the mayo so most people will need more – closer to 1 cup. However, I think it’s a good idea to add it a little at a time, stir it in and then see how creamy you want your salad to be. Chill in the refrigerator to let the flavors combine then dig in! Rosemary Chicken Salad is so versatile. I usually just eat mine on a bed of greens but you could easily put it on a sandwich. 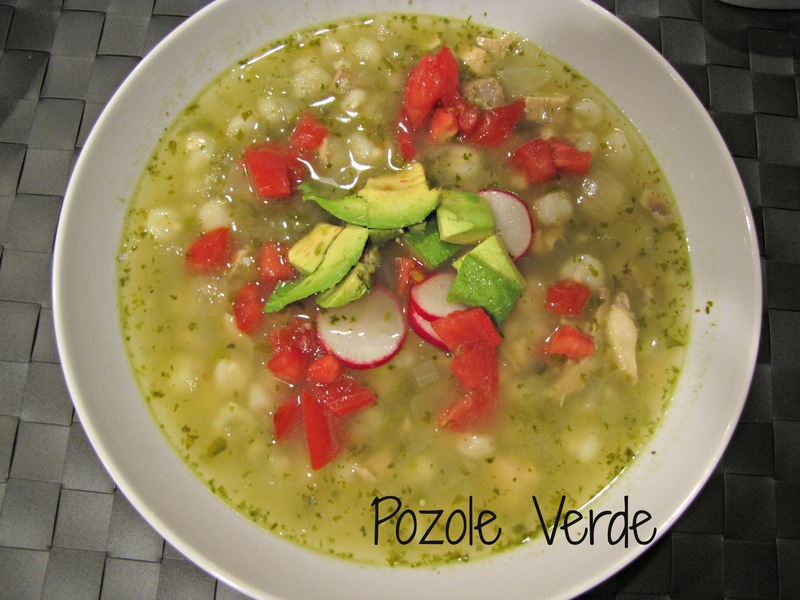 This keeps nicely for a few days in the fridge and the veggies stay crisp so I like to make a big bowl – 5 or 6 servings. It’s obviously a good lunch but makes a nice, light summer dinner as well. I bought a small thermos so that I can keep mine cold when I’m on the run or on the road so now I have no excuse not to make a decent lunch for myself! No more boring lunches. 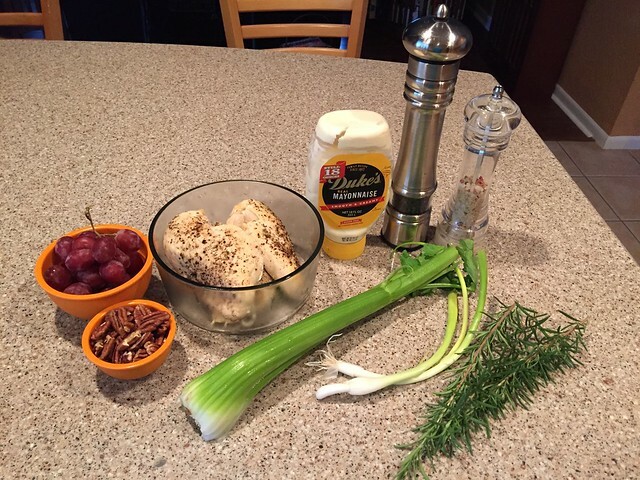 Rosemary Chicken Salad to the rescue! What’s your favorite lunch? Leave a comment and help me break out of my lunch rut! 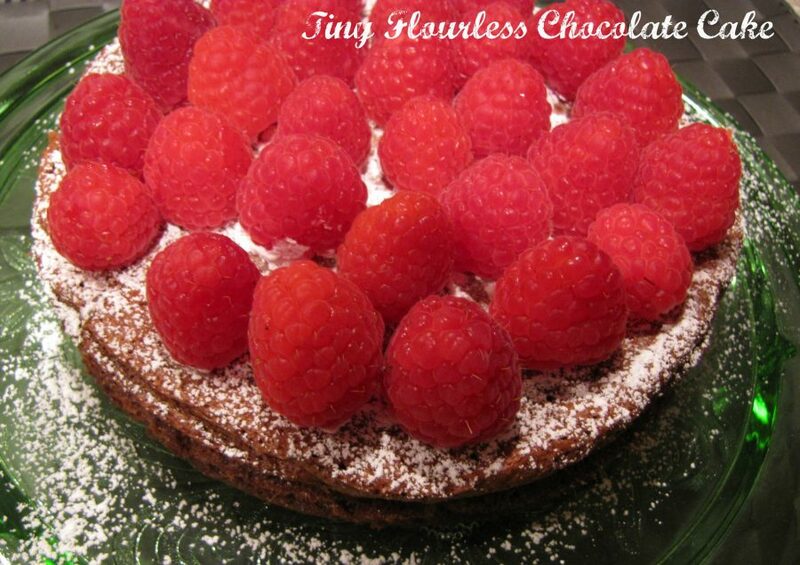 Claudia, Wonderful looking recipe!! I love rosemary and am never without a plant in my small herb collection. Rosemary (and thyme) and poultry (and dressing) were made for each other. I especially like garlic and rosemary roasted potatoes. I find that sometimes fresh rosemary can overwhelm other flavors. I zap it in the microwave for a few seconds after I pull it off the stem or toast it briefly in my toaster oven. Tones down a bit of that piney edge. I’ll definitely try that microwave tip. I love rosemary but I know some people think it can get a little overwhelming. Thanks, Roz!